You are usually recommended an audiometry test if you are having difficulty in hearing properly or there is some problem with your ability to hear. The test is noninvasive and painless and evaluates your ability to hear different frequencies, pitches and sounds. It is also recommended to the patients having tumor around or in the ear and who may have to face hearing loss after or before the surgery. Audiometry test also determines whether you will require hearing aids after surgery or your ability to hear will improve. How Does the Audiometry Test Work? Different audiometry evaluations are carried out during the hearing test. This type of test is used to measure the least audible or the softest sound a person can hear. 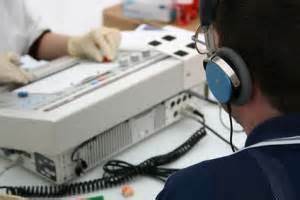 A person to be tested is asked to wear an earphone and sounds of particular range are directed towards either of his ear at one time. The intensity or the loudness of the sound is measured in decibels or dB. This test determines the hearing ability of adults and grown up children. The test results are depicted on an audiogram, which is a special graph showing hearing loss pattern. Another hearing test is the word recognition test also known as the speech discrimination test that assesses the ability of a person to recognize the words or understand the speech from the background noise. In case you have low speech understanding or discrimination ability, you will hear garbled sound. This test is usually carried out to predict whether the person requires a hearing aid or not. A tympanometry test is carried out to detect ear problems such as wax or fluid buildup, ossicle bone damage, tumor inside the middle ear or perforated eardrum. It is used for evaluating the brainstem and cranial nerves. These tests do not pose any health risk or damage to the ear. The result of the test is given by the audiologist and is evaluated by your physician with expertise in neurosurgery or by an otolaryngologist. Accordingly, the condition is diagnosed and aids and medications are recommended. OAE is a painless, quick and simple method of screening the newborns for testing loss of hearing. It is a highly sensitive test, which detects even a small amount of hearing loss. If the response is good, then it means that the newborn baby do not have any hearing problem and do not need to face other tests. If the test response is not as expected the parents are advised to follow it up with automated auditory brainstem response (AABR) test. In case this test also comes out to be negative then the doctor might recommend higher diagnostic tests. Both these tests are done when the baby is asleep because the response is very small and even a little bit of movement or sound can deviate the accuracy of the result. This type of audiometry test is carried out on young children. It is a type of reward test in which the child is rewarded every time he responds to the sound. The child is made to hear different types of sound to assess his hearing ability. The test helps to identify whether the child can identify the quietest of the sound.